We could have added chocolate sprinkles on top so we could call these quadruple-chocolate cupcakes. But we found sliced strawberries tasted better. Prepare cake batter as directed on package. Stir in chopped chocolate. Spoon into 24 paper-lined muffin cups. Beat pudding mix and milk in medium bowl with whisk 2 min. (Pudding will be thick.) Stir in Cool Whip. 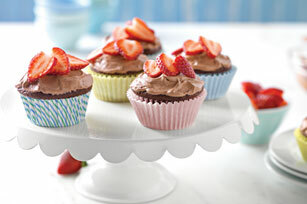 Frost cupcakes with pudding mixture; top with strawberries.